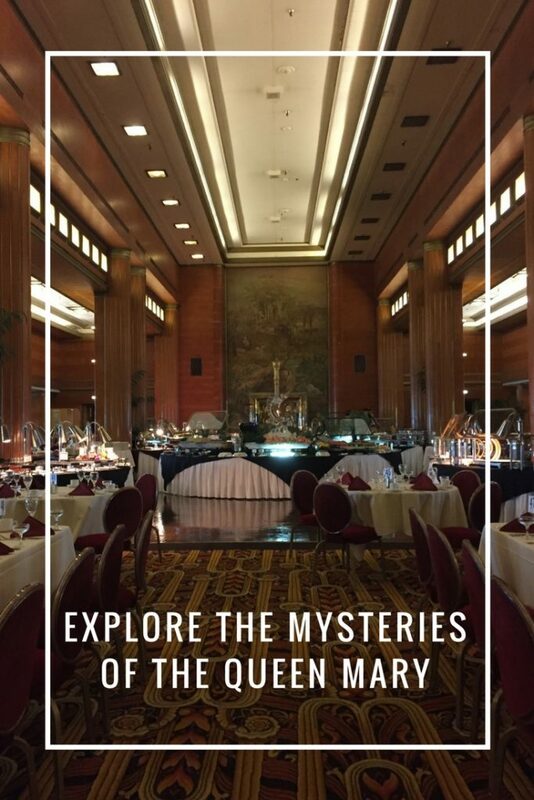 The Queen Mary Hotel has the distinction of combining an incredible history with amazing architectural details. 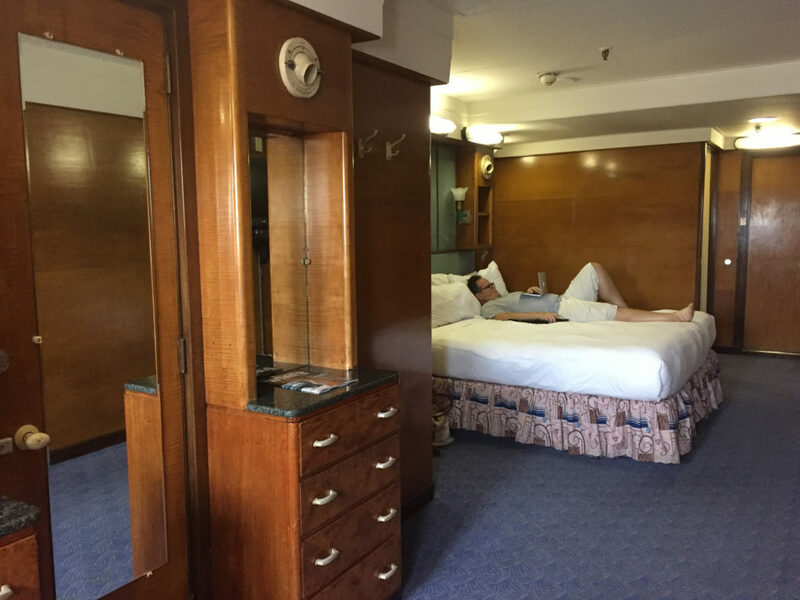 Both elements appeal to Andy and me, so when we were looking for a hotel close to home to celebrate Andy’s birthday, the Queen Mary ship won our attention. It’s not without its pitfalls, but it’s a truly unique experience. 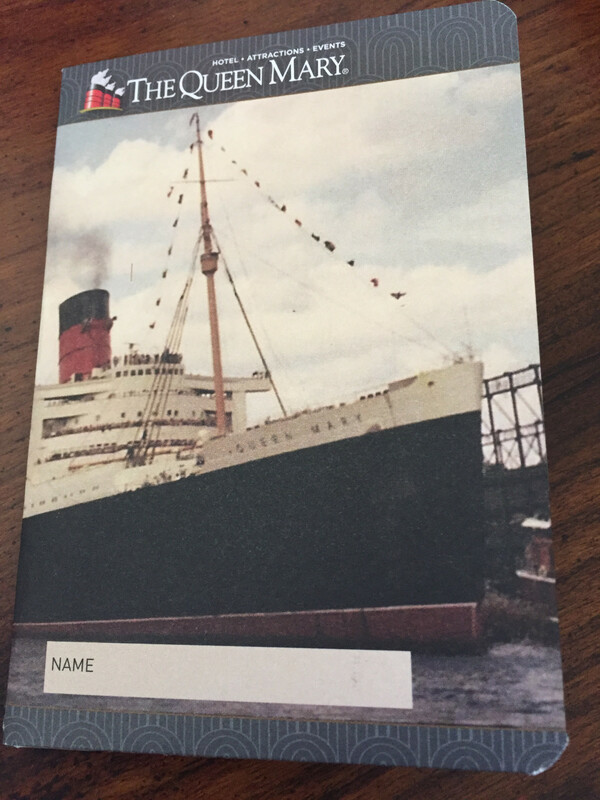 The ship’s first voyage was in May of 1936. Built to provide an opulent passage for its royal and celebrity guests, the designers spared no expense. In fact, to this day, the ship is noted for its extraordinary Art Deco detailing. In September of 1939, the ship was converted into a troop ship. Everything was stripped down to essentials, with the famous murals boarded over and the pools drained. 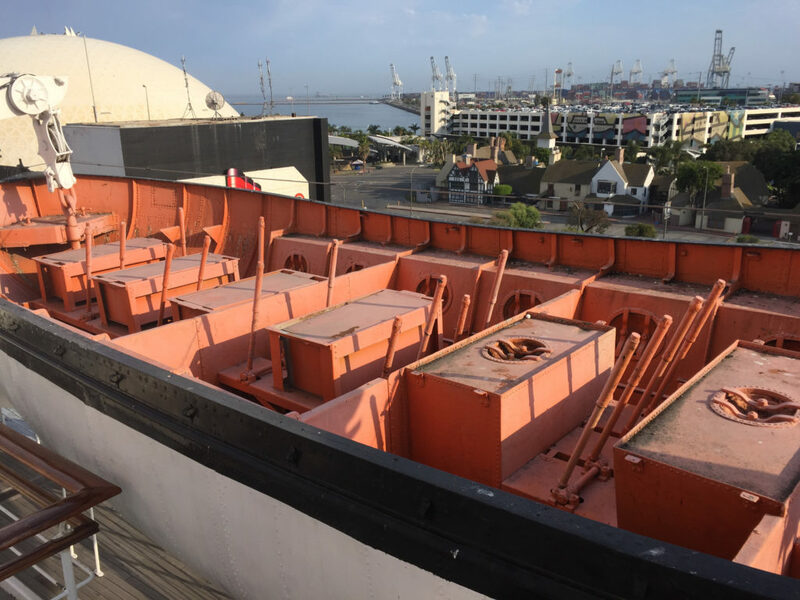 Furnishings were removed, and the ship went from carrying a few hundred passengers to carrying as many as 16,000 troops through dangerous wartime waters with lifeboats that could carry only half that many lives. The “Grey Ghost,” as she was then known, miraculously escaped being torpedoed, and successfully saw out the war. In 1947, after years of being refinished to her former style once again became a glamours passenger ship. 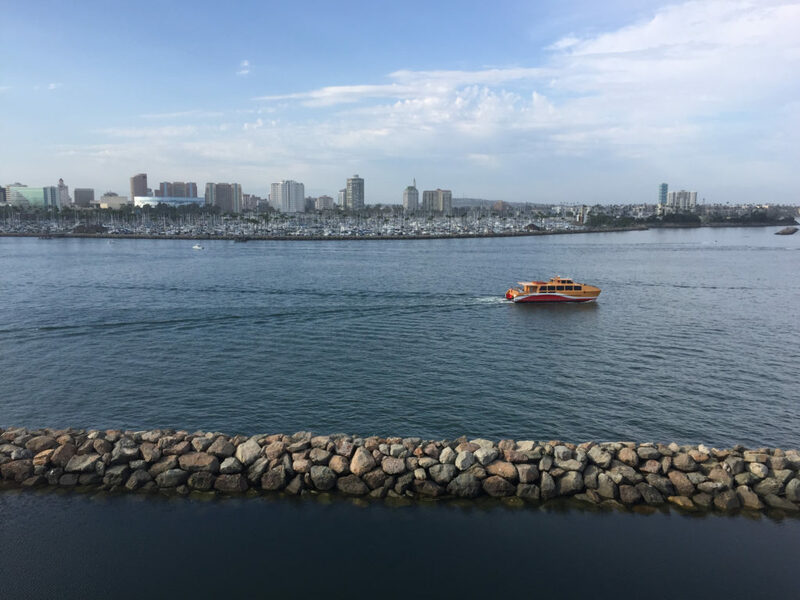 She remained in service as part of the Cunard line until 1967 when she retired to her current home in Long Beach, California. Obviously, this history is greatly condensed. The ship itself has a fascinating set of exhibits that allow current passengers to see how the troops were ferried across the seas. You can read about their close calls, and you see diary entries of those who traveled aboard as servicemen and women and war brides. 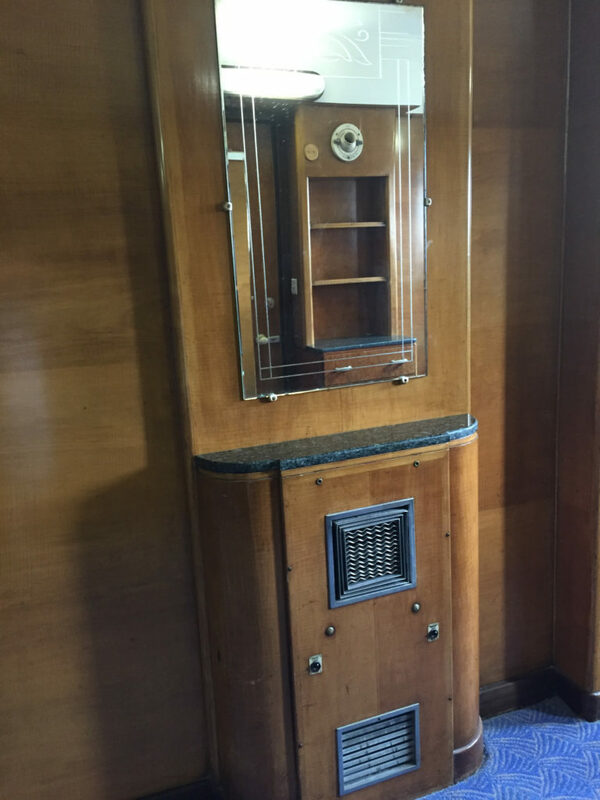 You can also see how the accommodations changed from first class passengers to third class, shared staterooms. 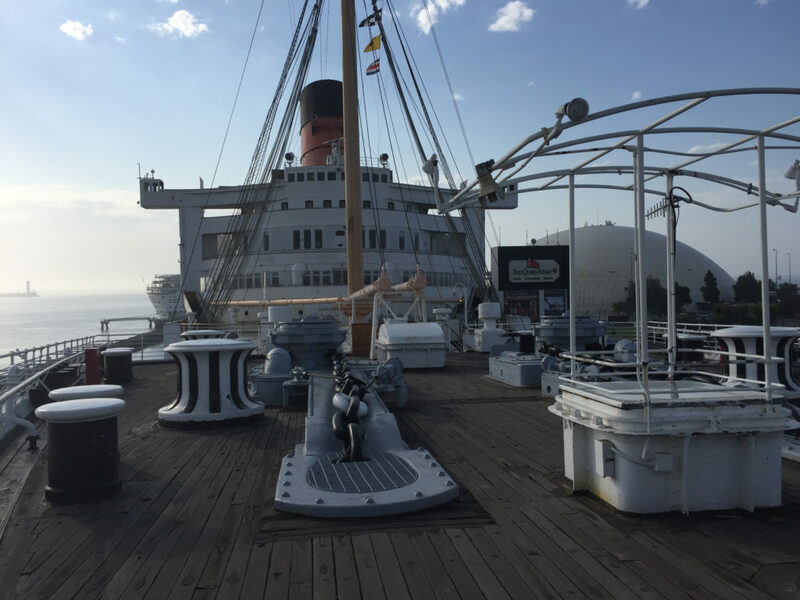 To explore the historical exhibits on the ship, you can wake a self-guided tour (which is what we did), or sign up for The Glory Days Historical Tour (you can also take the tour at Twilight). 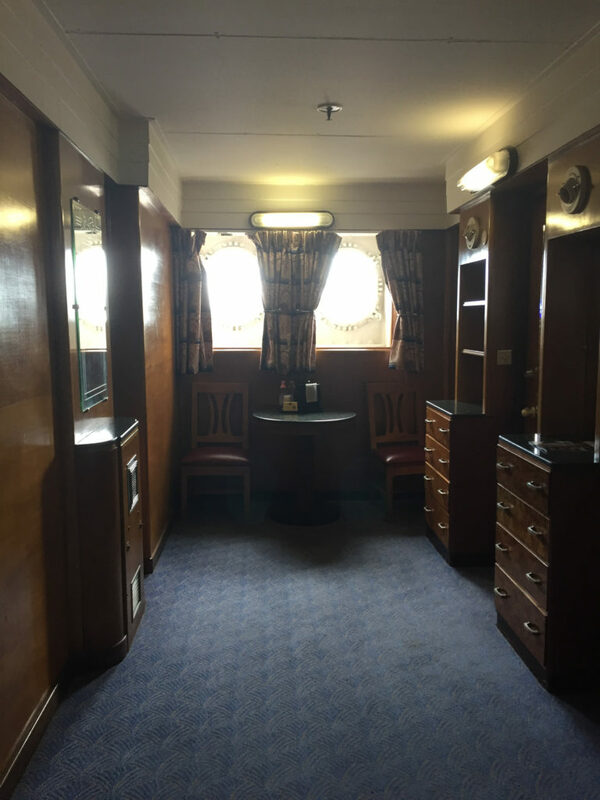 Really, the entire ship is fairly open for people to explore, but there are some places, like the first class Art Deco pool that can only be seen as part of the tours. 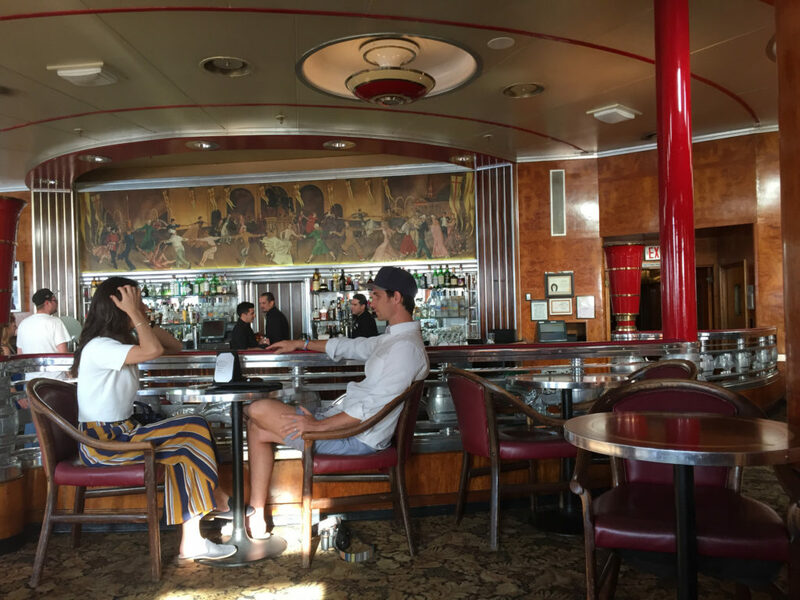 The Observation Bar has one of those amazing original murals and sports some impressive Art Deco fixtures and style. It can get crowded, and it’s a bit hot, particularly when the sun is coming through in the late afternoon. But you should at least wander through to see it. The Chelsea Chowder House & Bar is a fun spot for every meal. There are some nice views along one side, and there are informative art pieces on the wall giving you little factoids about the ship. There is also a small bar at the entrance. Sir Winston’s Restaurant is listed as one of the finer restaurants in the area. Alas, we didn’t get a chance to try it out (a story for later), but we do plan on returning to give it a go. 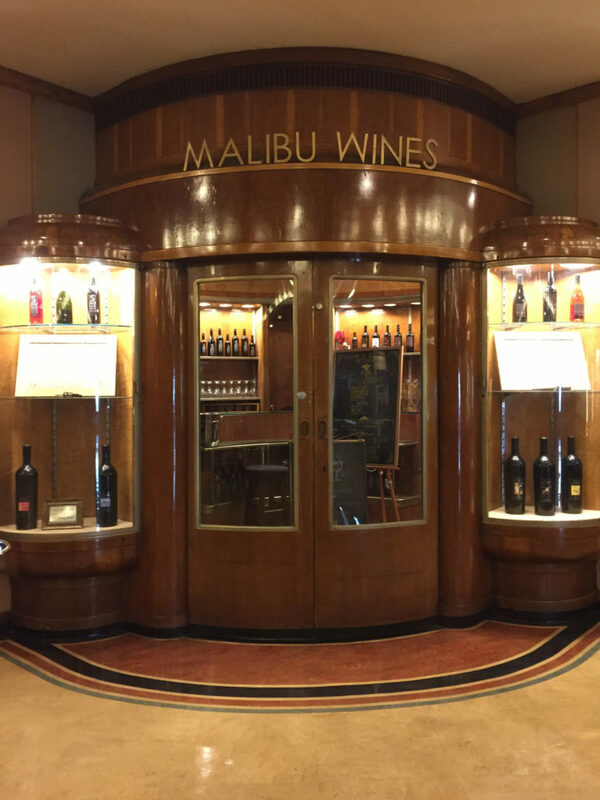 While most of the ship is casual, you might want to go a bit more upscale for Winston’s. Every Sunday, the Champagne Sunday Brunch is held in the Grand Salon. I so want to do this! It’s expensive – basically $60 per person. But I’d still love to try it one day when I have enough cash to dive in. 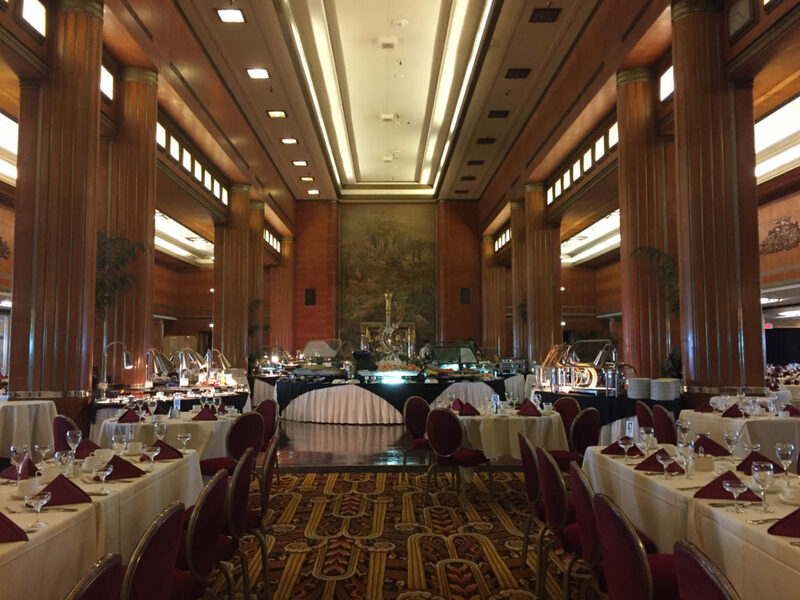 Brunch in the main ballroom on the Queen Mary. Let me start by saying again that we love staying in hotels that have some history to them. While some places have to work to create an interesting atmosphere, the Queen Mary Hotel was built with it. It’s not something that is easily captured on film (or by digital device). There’s just something you feel when you step on board that you have to experience for yourself. But they face an interesting challenge – how do you keep the original touches that make it so intriguing and still meet modern standards? It’s not an easy task. The room was beautiful. We splurged a little and went with a deluxe king on M deck. It gave us a little sitting and changing area that was lovely. The built-ins were beautiful, and we even found ourselves fascinated by the air ducts. The bathroom still had the old fixtures (just there for show now) that indicated hot and cold salt water or fresh water bathing options. And while the bathroom was clean, it was showing some major wear. The tub finish was peeling and was in need of re-glazing. We loved seeing the engraved glass on each stairwell leading to the different decks, and we enjoyed being on the M deck, as it was only one deck below the Promenade. There were five weddings going on that weekend on the ship, and we ran into three of them on Saturday afternoon as we roamed the decks. 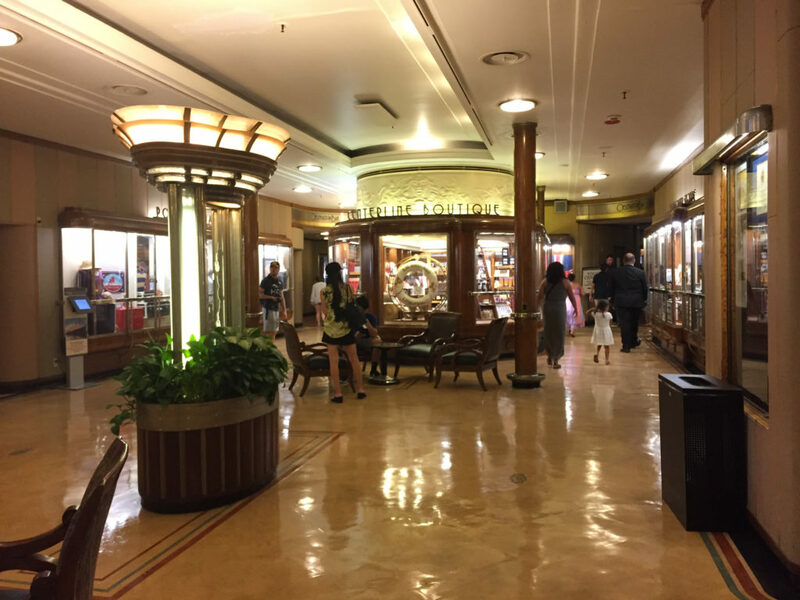 We got a chance to walk through the salons, see the artistry behind the set-up of the Midship Marketplace and enjoy sounds of the ship’s horn. We saw the exhibits of the radio operators, took an old engine self-guided tour, and even went around the cut-out to get a look at one of the ship’s propellers. It really was an engineering marvel, but I’m pretty sure she has seen her last days at sea. I’m not even sure they could easily move her if they wanted to do so. Right now, the “Diana: Legacy of a Princess” exhibit is being held up on the Sun Deck. We didn’t get a chance to see it, but if you are a fan, it looks like something that would really capture the imagination. Can you get seasick? Hmmmm maybe? I did get ill the night we were there, but that probably had more to do with our lunch before we arrived than the ship’s movements or any apparitions hanging about creating an uneasy atmosphere (or stomach, in my case). If you are prone to it, I’d say take a Dramamine to give yourself peace of mind, but the ship doesn’t feel like it is moving at all. It is surrounded by a stone wall, and it seems like it is probably mired in mud, as well as being “tied” down. 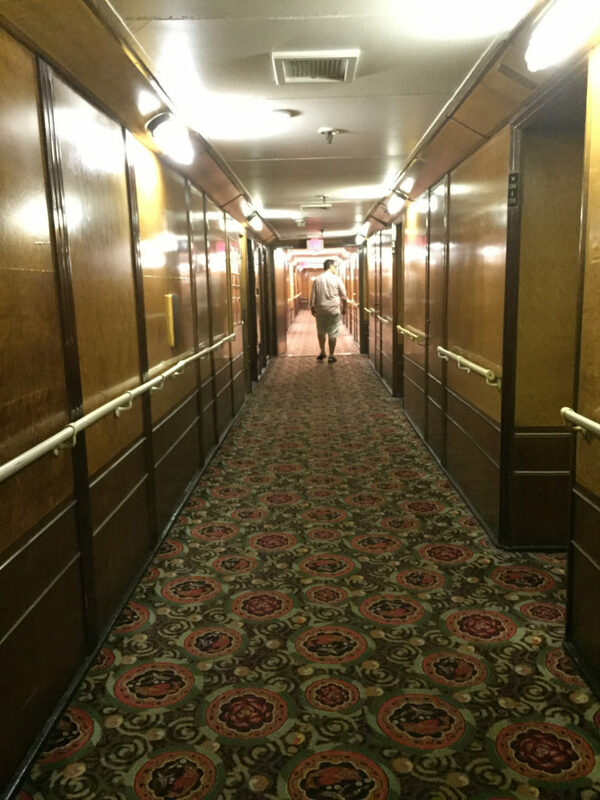 Are there any big downsides to The Queen Mary Hotel? I didn’t like the pricing strategy. Basically, we paid one price for the room plus taxes and fees. Then when we arrived, there was another mandatory fee to cover Wi-Fi, the fitness room, and preservation fees. I don’t mind paying money into the system to help restore and preserve the ship, but if all of those fees are mandatory then add them to the price of the booking, so I know what I’m dealing with from the start. Valet is $27. Self-parking is a little bit cheaper, but on the weekend with all of those weddings going on, we weren’t going to get into that lot (although there was a ton of parking, the majority of it was reserved for valet). Food is very expensive, but it is also quite tasty, and I assume that all hotel food is going to be more expensive than what you find at an outside restaurant. The ship is going through major modifications right now, so there are places you cannot explore. However, the places that are opening have a great deal to offer anyone with an eye toward history. All in all, I would have to say that I would visit again. They have music events on the ship that sound like a lot of fun, and, of course, someday that brunch will be mine!